Application Data-Metabolism-Propafenone | Yecuris FRG: humanized animals and human hepatocytes platform for your next great discovery. Project Aim: Understanding human specific metabolite formation and clearance in high-turnover compounds. Propafenone is a CYP2D6 metabolized molecule that produces human and rodent specific metabolites. This probe substrate was selected due to the fact that rodent hepatocytes demonstrate approximately 20-fold higher activity over human which sets a high-bar for system performance. Very highly repopulated (95%+) animals were utilized in the experiment to minimize the contribution of the mouse. Experiments in other model systems with lower levels of repopulation failed to demonstrate the human specific metabolite. 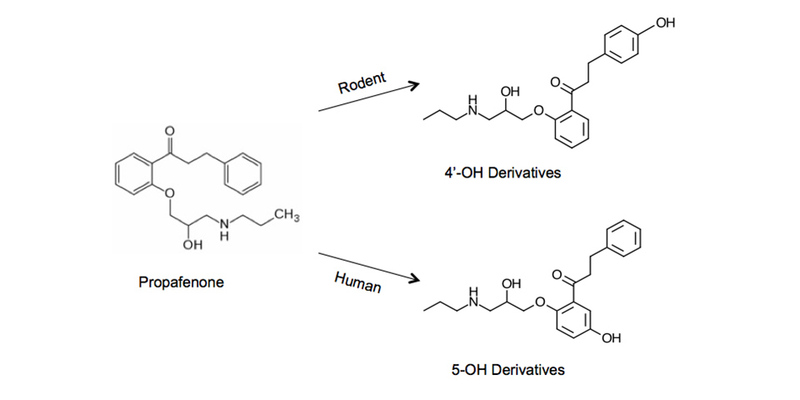 As expected, both rodent and human metabolites are observed since even a small number of remaining mouse hepatocytes can contribute significantly to metabolite formation. To demonstrate reproducibly between animals and to explore donor differences, we dosed six animals representing two independent donors. We note low variance between animals, but substantial differences in clearance profiles between the two donors in the experiment. We hypothesize that this is at least partially explained by phenotypic variants of 2D6, which are highly polymorphic in human populations. Since first running this compound in 2012, we have completed two additional sets of validation that reproducibly demonstrate the ability of highly repopulated animals to produce human specific metabolite.